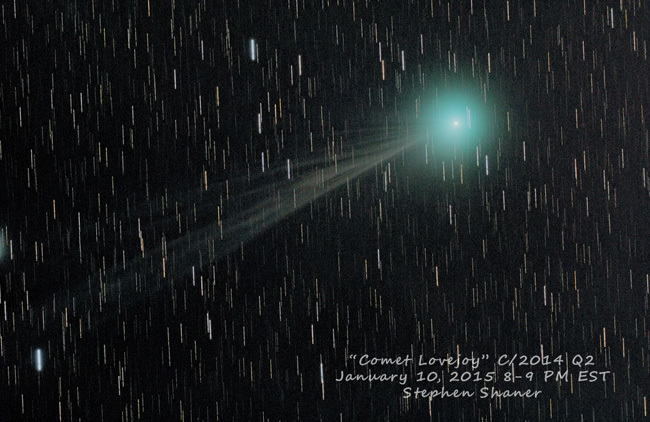 Caption: Comet Lovejoy imaged on January 10th by the ever-impressive CNY astrophotographer Stephen Shaner. 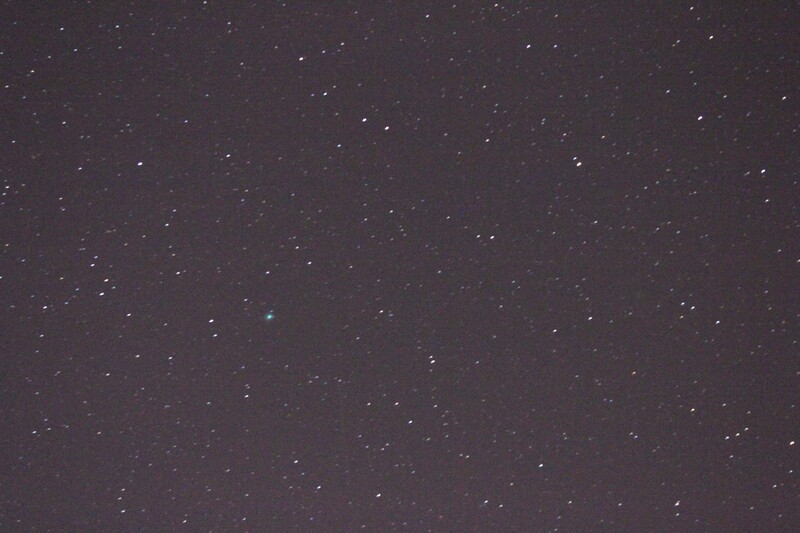 From his CNYO Facebook Group post: Last night was the first in over three months it was clear enough to shoot, but it worked out well because Comet Lovejoy is at its peak. 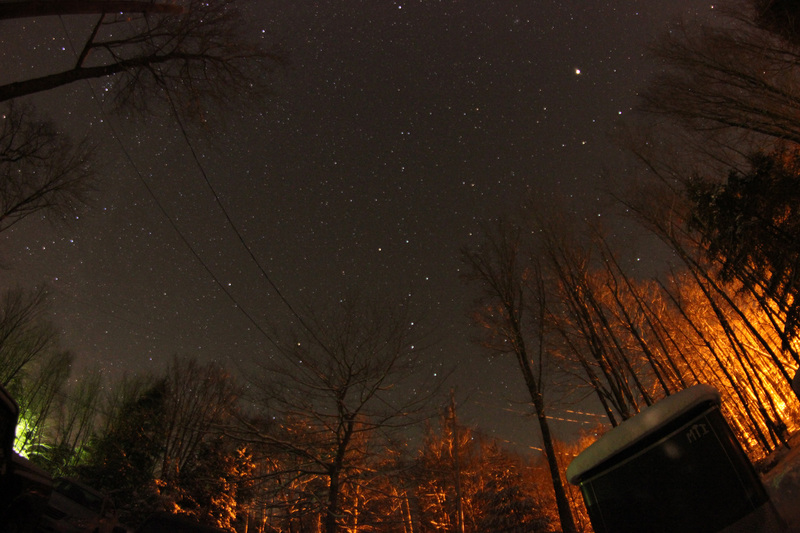 Here’s a quick process of about 40 minutes of exposures between 8-9 PM as it crossed the meridian. FOV is roughly three degrees. Distinct pale green coma in the eyepiece but unable to make out a tail or see it naked eye. 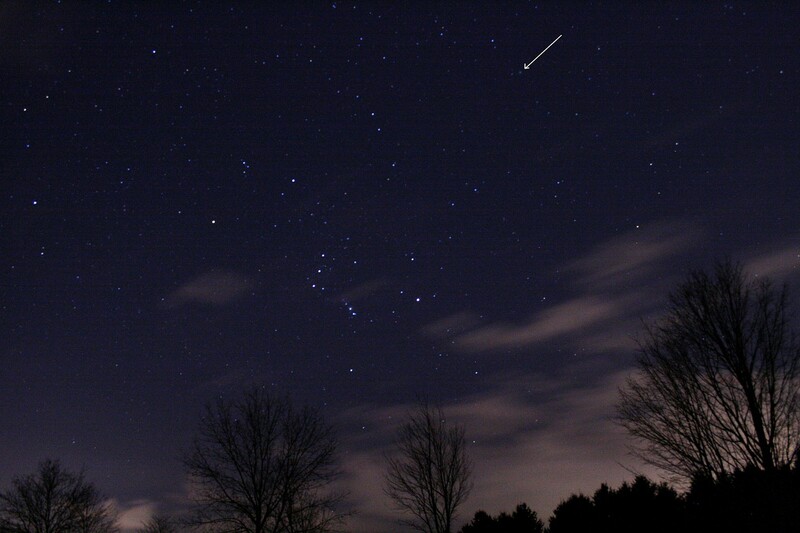 The 2015 skies are going to be full of comets. Well, at least six, to be exact, that will be either naked eye- or binocular-visible. That’s still quite a few to those keeping track! The amateur astronomy community has taken heroic efforts to scientifically identify and track new comets in the last, say, 400 years. 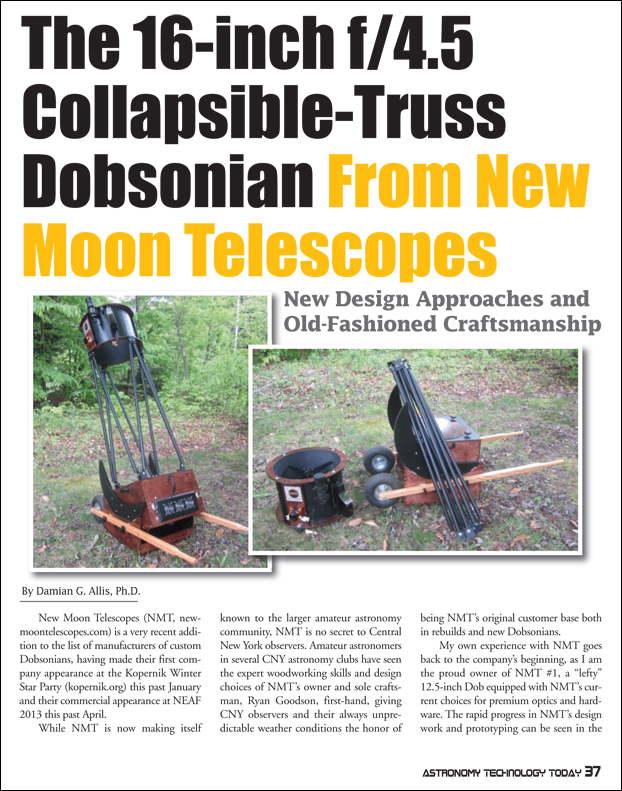 The rise of, for instance, the Panoramic Survey Telescope & Rapid Response System (or panSTARRS) as a method for finding and tracking both comets and near-earth asteroids (or, lumped together, “objects,” for which you might hear the abbreviation “NEOs“) has greatly increased the number of accounted-for fuzzy objects in our fields of view (and provided us a giant leap in our existential risk assessment infrastructure to boot). Quite simply, we’ve more + better eyes on the skies, meaning we’re bound to continue to find more and more comets and asteroids. You can even subscribe to NASA twitter feeds that announce the passing-by of these hopefully passers-by (see @AsteroidWatch and @NasaNEOCam). 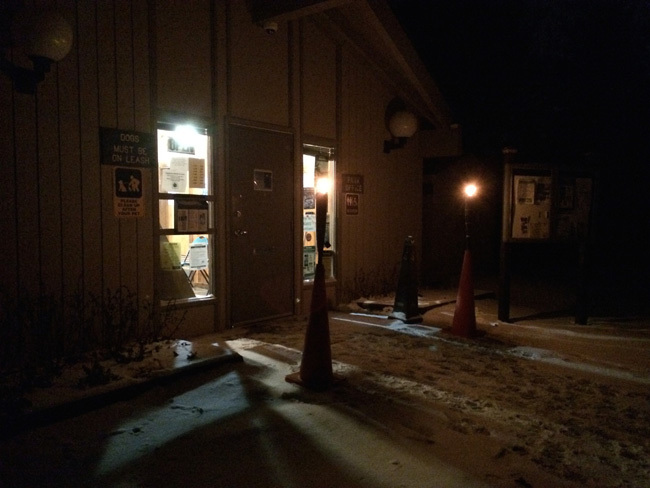 Caption: The tiki lounge at Green Lakes State Park, 9 January 2014. 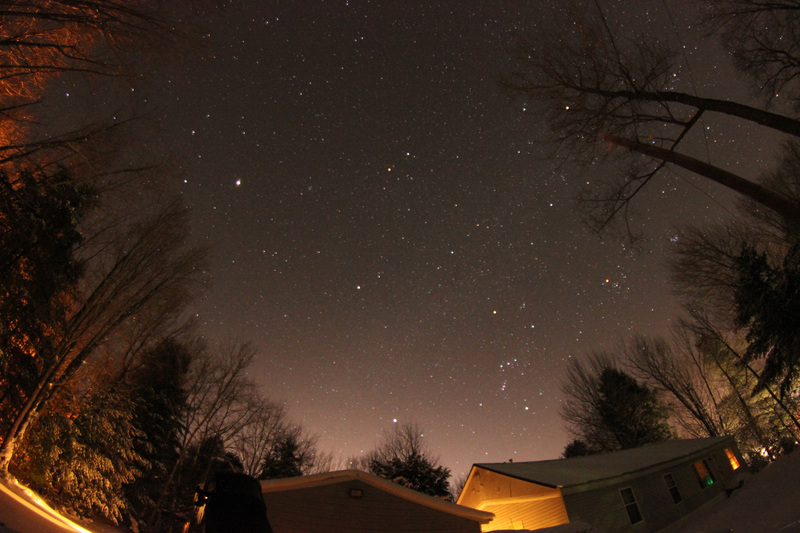 Caption: A very prominent Orion and arrow-ed Comet Lovejoy from the Green Lakes parking lot. Photo by Kim Titus. Caption: An array of Winter’s finest from Jamesville Beach, 10 January 2014, 8:00 p.m. Click on the image for a full and unlabeled version. Caption: An unmistakable view of Comet Lovejoy. Image by Bob Piekiel. As with all astronomical phenomena (excluding solar viewing, of course), the best views come from the darkest places. A third Lovejoy session was had up in West Monroe, NY on Wednesday, January 14th with fellow CNYO’er Ryan Goodson at New Moon Telescopes. 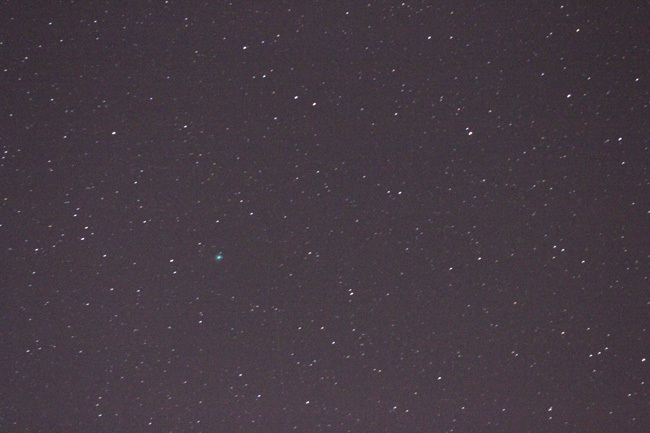 Putting his 27″ Dob to use, the green-tinted Lovejoy was almost bright enough to tan your retina. With dark skies and no observing line, we then attacked some subtler phenomena, including the Orion Nebula in Orion, the Eskimo Nebula in Gemini, and the Hubble Variable Nebula in Monoceros. The images below are our selfie with Lovejoy and the best of Winter, a snapshot near the zenith (with Jupiter prominent), and the Northern sky (click on the images for larger, unlabeled versions). 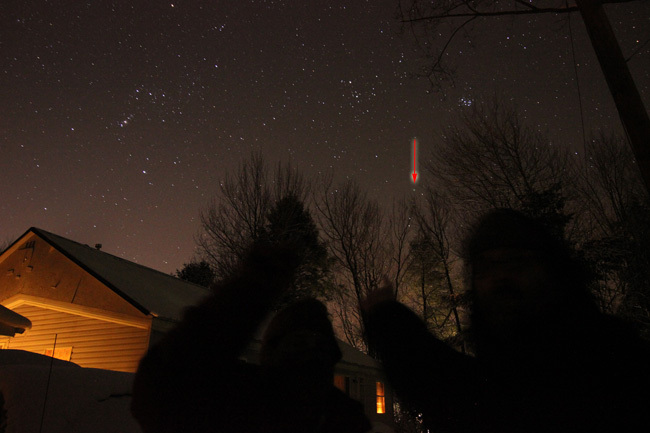 Caption: Ryan and I pose for 30 sec, our fingers completely missing the location of Lovejoy (red arrow). Click for a larger view. 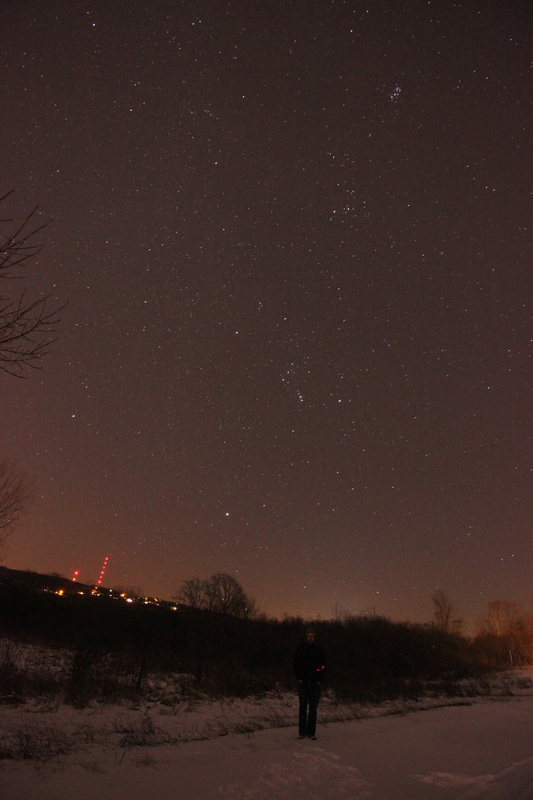 Caption: Some of Winter’s finest from NMT HQ, including a prominent Jupiter just to the west of (and about to be devoured by) the constellation Leo. Click for a larger view. Caption: A view of NMT’s opening to the North, including Cassiopeia at left (the sideways “W”), the Big Dipper in the middle, and Jupiter at the right. Click for a larger view. It’s one of the cold realities of amateur astronomy – you never realize how cold it can get outside until you’re standing perfectly still at a metal eyepiece. The solution is as old as the sediment-grown hills – layers! 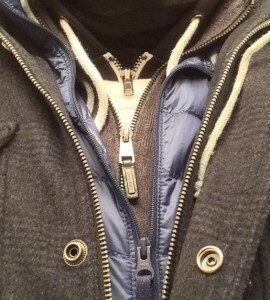 The top half of my outfit for the evening is shown below, featuring six (yes, six) layers from turtleneck to final coat. My bottom half featured three layers that decorum permits me from showing here. For those wondering how the blood still flows below the belt, the answer is simple – buy yourself an outer layer two or three sizes larger than you usually wear. In my case, my outer coat’s a bit baggy and my outer pants are a very tightly-meshed pair of construction pants with a 40″ waist (from a trip to DeJulio’s Army & Navy Store on Burnet Ave. in Syracuse).